Stocks extended gains, while the dollar and Treasury yields tumbled after the Federal Reserve shifted to a more dovish tone Wednesday. Here are some of the things people in markets are talking about. The Federal Reserve said it will be “patient” on any future interest-rate moves and signaled flexibility on the path for reducing its balance sheet, in a substantial pivot away from its bias just last month toward higher borrowing costs. The Federal Open Market Committee “will be patient as it determines what future adjustments to the target range for the federal funds rate may be appropriate to support” a strong labor market and inflation near 2 percent, the central bank said in a statement Wednesday following a two-day meeting in Washington. In a separate special statement on Wednesday, the Fed said it’s “prepared to adjust any of the details for completing balance sheet normalization in light of economic and financial developments.” The central bank also said it would be ready to alter the balance sheet’s size and composition if the economy warrants a looser monetary policy than the federal funds could achieve on its own. Stocks in Asia are poised to rally after U.S. shares soared and the dollar tumbled in the aftermath of the Fed meeting. The S&P 500 Index rallied to an eight-week high, the Dow Jones Industrial Average jumped 400 points and the Nasdaq 100 Index added more than 2.5 percent, while the dollar weakened to a four-month low. Major equity gauges were already higher on the day as technology shares rallied after Apple Inc.’s results beat estimates and Boeing Co. helped boost industrial stocks. The Treasury yield curve steepened as the two-year rate sank while the 10-year level fell less sharply. Elsewhere, iron ore surged after Brazil’s Vale SA, the world’s largest producer, outlined plans to cut output after a deadly dam breach. Oil rose above $54 a barrel as a government report showed a steep drop in imports from Saudi Arabia. The U.S. and China launched high-level trade talks in Washington with little indication that Beijing will bend to U.S. demands to deepen economic reforms. 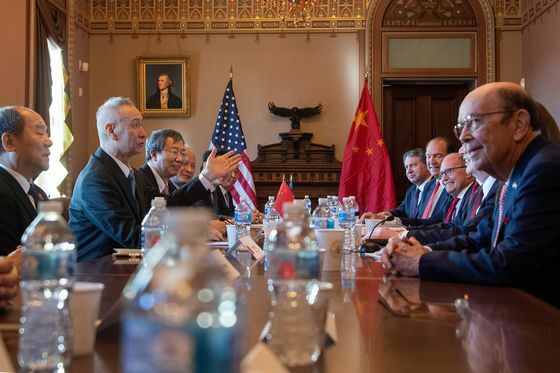 Talks between senior officials from the two sides, led by U.S. Trade Representative Robert Lighthizer and Chinese Vice Premier Liu He, at the White House complex in Washington that began on Wednesday morning were expected to be followed by a working dinner. Negotiations will resume Thursday, when President Donald Trump is expected to meet Liu. It’s the highest-level talks since Trump sat down with Chinese President Xi Jinping in Argentina on Dec. 1 and declared a 90-day truce to reach a lasting deal to end the trade war. While a breakthrough deal is seen as unlikely from this round of negotiations, the White House has said a concluding statement will be released on the progress they’ve made on core issues such as Chinese technology transfers and intellectual property practices, market access and Beijing’s pledge to buy more American goods. Alibaba Group Holding Ltd.’s quarterly earnings beat expectations after an expansion into new areas like cloud computing, a rare bright spot as many Chinese companies fell short of financial estimates. Alibaba’s results came after a stunning day for China when at least 20 companies warned investors that full-year earnings would lag expectations. Its resounding beat stemmed in part from a $3.3 billion accounting gain after revaluing a subsidiary, and executives warned of uncertainty during a deceleration of the world’s second largest economy. An Apple Inc. hardware engineer was charged by the U.S. with stealing driverless car secrets for a Chinese company, the second such case since July. The company discovered that Jizhong Chen, who was hired in 2018, had taken photographs inside a secret work space and had downloaded 2,000 files, including manuals and schematics for the robocar project, according to a complaint in federal court in San Francisco. Prosecutors said Apple considered disclosure of the data to be “enormously damaging.” Separately, Apple plans to launch iPhones with a more-powerful 3-D camera as soon as next year, stepping up the company’s push into augmented reality, according to people familiar with the plans. Too many investment bankers in China. Facebook tops estimates. Tesla misses. Microsoft in line. Australia’s tax enforcer sets sights on Uber drivers, Airbnb hosts. China protesters scuffle with security as trade-war talks being. Foxconn rethinking plans for Wisconsin factory. SoftBank’s debt burden looks worse than it actually is. Stocking the best home bar doesn’t mean buying expensive bottles.